Mother Nature, in all her wisdom, created hard-working microbes to begin the process of breaking down everything; from a giant redwood to a blade of grass, into usable, life-sustaining compost to nourish new plant life. As trees and plants crumble, the former home to animals and birds becomes a workplace for microbes - millions and millions of microbes. They all play a huge part in the decomposition process by burrowing, nesting, eating and adding their waste to the mix. The end result is dark, moist, fertile compost that builds healthy soil; feeding and promoting new plant life. Since the ecosystem needs all the compost it makes, we don't suggest you forage the forest floor for the stuff. Then again, you don't have to. Since city dwellers create just as much greenwaste in urban settings as in nature, we have all the organic materials we need to make our own! We're just fortunate that regional compost facilities have stepped up to give Mother Nature a hand with the process. Recycling plays an important role in the city ecosystems; with compost facilities providing the perfect conditions for the composting process to take place - only faster! Incorporqting compost into your landscape is easy and economical. Whether you need a little compost to spruce up flower beds or a few yards to top dress your lawn; help is only a phone call away. Call or visit one of our authorized dealers on the Central Coast to begin improving your landscape with fresh, local Harvest Blend Compost. From a bucket to a truckload; big job or small, however you measure it Harvest Blend Compost does it all! Lawn Top Dressing: applying a layer of compost to the surface of the lawn will improve soil and grass for a lush, green turf. Turf Establishment: amending soil with compost provides nutrients and improves water holding capacity, saving money on water! Flower & Vegetable Gardens: adding compost before planting creates the perfect foundation for new plants. or top dress existing beds to give soil a boost. Tree & Shrub backfill mix: compost opens compacted soil, adding oxygen for an improved root system. Premium Harvest Blend Compost is the ideal soil amendment for lawn and garden since it decomposes into the appropriate chemical balance to nourish the soil. Feeding your landscape with compost lessens the need for chemicals, strengthens plant roots, conserves water and improves all soil types. Compost improves low quality soils by adding organic matter and nutrients. Plants grown in nutrient rich soil are healthier and have greater resistance to disease and insects. By greatly reducing the need for pesticides and fertilizers you save time and money. Naturally! "Anytime is the right time to feed and improve you soil"
When asked to pick a subject for this article, container gardening was at the top of the list. 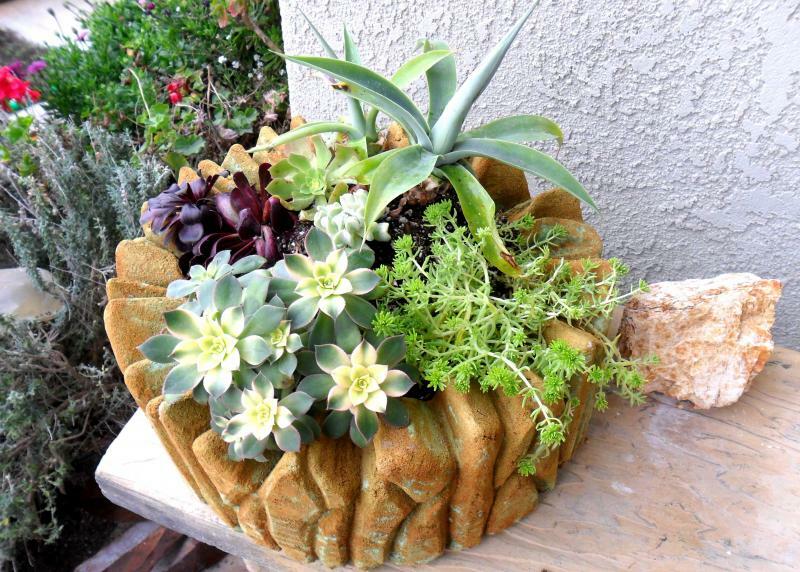 There is no statement container gardens can't make. 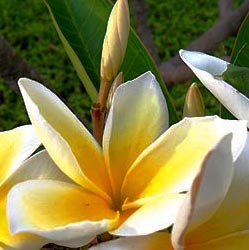 They can appear lush and tropical, hardy and drought tolerant, whimsical or even edible. They can be understated and elegant, such as a spiral topiary in matching vase or urn style pottery that may frame a doorway or entrance. They can laugh out loud with lavender or snapdragons mixed with trailing bacopa, lobelia or ivy geraniums. They can appear functional with dwarf citrus, pineapple guavas, grapes, rasberries, blueberries and even varieties of apple, pear and persimmon trees. Multi trunk low growing palm trees, ferns, azaleas, gardenias and razzleberry are long time favorites. Time after time, succulents have proved worthy with different shapes, sizes, colors and out of this world textures, as well as their extreme low water and maintenance requirements. The choice is yours to make. Here are a few suggestions to make your project fun and easy. The pottery or container should always be a little deeper and wider than what is being planted in it. Small rocks or broken pottery should be placed at each drainage hole. Almost all container gardening will include Nurseryman potting soil mixed with Paydirt. Succulents and cacti will need Cactus mix. If privacy or a windbreak is desired, try planting purple Hopseed bushes, or Black Stem or Silver Sheen Pittosporum. Tea Trees or Leptosporum in mixed colors are also an excellent choice. By framing the courtyard or patio with well planted pottery or half barrels it will instantly transform itself into an outdoor room. In other scenarios, less is more. Small groupings of three or four pots in the corners or a center piece focal point work best. Choose the same style of pottery in different sizes and place them side by side or in a triangle type fashion. This will avoid the assembly line or cluttered look. It is best to start with low growing or trailing plants in smaller pots, working your way up to larger or more upright growers in the bigger pots. A good example of this would be small herbs or strawberries leading up to a dwarf citrus or fruit tree in the center. When planting succulents, place them almost right next to each other to achieve that instant look. Many varieties will flower, so ask your nursery person which succulents will work best for you. When choosing tomatoes or plants that will vine, make sure and add a sturdy tomato cage or trellis. This will help prevent breakage from limbs becoming too heavy, as well as providing a more upright feel. Whether you are planting in sun or shade the choices available will appear endless. Don't be afraid to ask your nursery person for advice or suggestions, that's why they are there. It's also a good idea to bring a photo or sketch of the area you wish to improve. 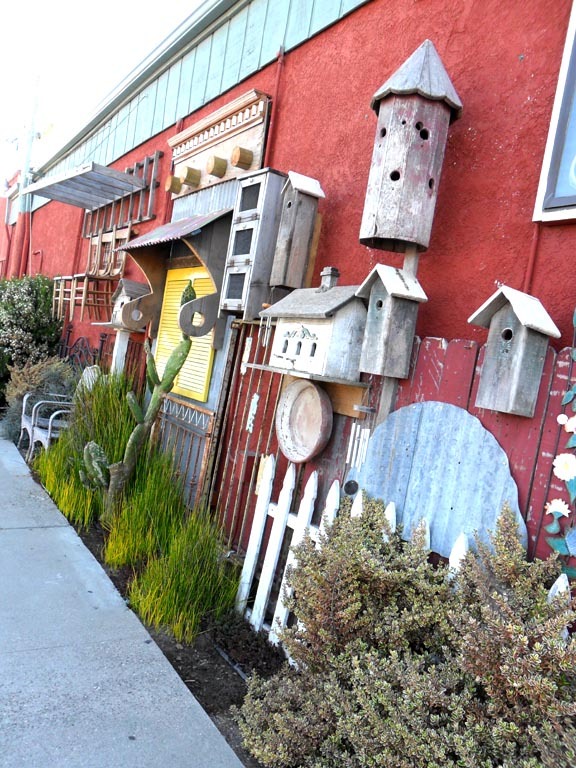 Whispering Tree Nursery in old Orcutt can make container gardening easy and fun with one stop shopping. Come check out the pallets of custom pottery and with new shipments contantly arriving you are sure to find that perfect container and who knows it might even be on sale! Large EZ to handle bags of Nurseryman's Potting Soil, Paydirt and Cactus Mix are always on hand, and we load your vehicle. Don't forget to ask if there are any "in house" specials or new items that might be of interest . Remember; describe your space and the nursery people will help make container gardening extremely easy and fun! Now go get dirty and "Happy Growing"! 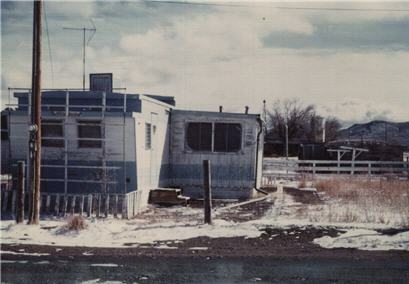 In early spring of 1976, my husband and I moved from a fair-sized city to a one-half acre plot of ground in a rural high-desert area. The soil was poor, mostly alkali, scattered with rocks. The climate, approximately three months of summer and the remainder of the year some degree of winter, with an annual rainfall between five and six inches most years. There was one living tree on the property, so scrawny we vowed to cut it down. I had brought a small volunteer tree from my former yard, and was watering it when a neighbor passed by. “You’re wastin’ your time and your water, honey, ain’t nothin’ gonna’ grow in these parts”. I didn't listen. I was the only thing green in the yard! We marked off sections with old railroad ties, which were available for picking up, made beds for flowers, vegetables, and fruit trees, all connected by rambling paths. Next we began looking for material to improve our poor soil. Ranchers had old, moldy hay which was unfit for cattle consumption. They were happy to be rid of it, and in one day, with our pickup and a small trailer we brought home 64 bales of spoiled alfalfa. This was spread in generous slabs over the beds, and then watered. We repeated this process until all beds were covered. By now we had acquired rabbits and chickens. Their droppings were added to the hay, along with sawdust from our woodshop. In about two years’ time, our soil went from sour, powdery alkali to what looked and smelled like real DIRT! The time had come to plant. 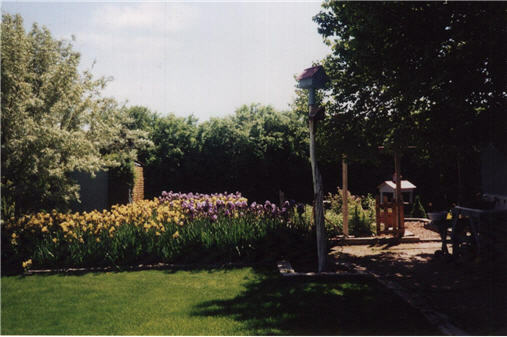 We began small, with a few annual flowers, some veggies and several small fruit trees. Our cool-weather crops fared well until mid-June, when the temperature soared to nearly 100°. Some promptly went to seed, others simply withered and died. Most of the annual flowers were hardy enough to withstand an occasional freezing night. However, fruit trees were another matter. Most of the time they would blossom out in April and then freeze in May. We could count on fruit every five to seven years. One winter it didn’t get above freezing night or day for over thirty days. Most of the fruit trees died. Roses, which we dearly love, are a big challenge. No matter how much acid mulch they receive, or how well they are protected in our cold winter climate, they just do not thrive. Other plants seem more able to withstand our extreme weather. Lilacs put on a good show every spring. We have them in shades of lavender, purple, red and white. The trumpet vines flourish, attracting hummers and bees. English daisies (asters) grow six to eight feet tall in the fall, full of buzzing bees gathering nectar from the pink blossoms with sunny yellow centers. After 35 years of blood, sweat, tears, moldy hay and many gallons of water, it is not unusual for people, when they drive by, to comment that our place is like a Garden of Eden in the barren desert. It has been a labor of love with lots of work thrown in. Real gardeners never, never give up! Rose-a-phobia; the fear of roses. This is a treatable condition. Rose-a-phobic: one who fears roses. A person afflicted with this condition CAN be cured. Rose-a-holic; one who cannot pass by a rose without stopping to smell and admire; one who cannot resist buying or planting the latest introduced roses. There is no known cure for this condition. (Although I believe there are support groups available, known as "Rose Societies"). The winter months are the most dangerous time of the year for anyone suffering from either of these conditions. This is the time when bare-root roses are available in all nurseries and garden centers. For the Rose-a-phobic it means facing that irrational fear every time they venture into a nursery. And it is irrational, roses are not to be feared. They bring beauty into your life. They are forgiving of neglect and mistreatment. So to those of you who fear roses, please be brave, contact a friend, loved one or professional who isn't afraid and let them guide you through your first rose purchase and planting. You will find the rewards far outweigh the risks. For the Rose-a-holic, it means being strong, trying to resist the never ending array of colors, smells, sizes and shapes of roses available. They are only limited by the amount of space in their garden, and often that doesn't stop them from adding 'just one more'. (We've all heard THAT one before!) They just have to have that new one, or color they are missing, or that favorite they've been looking for! 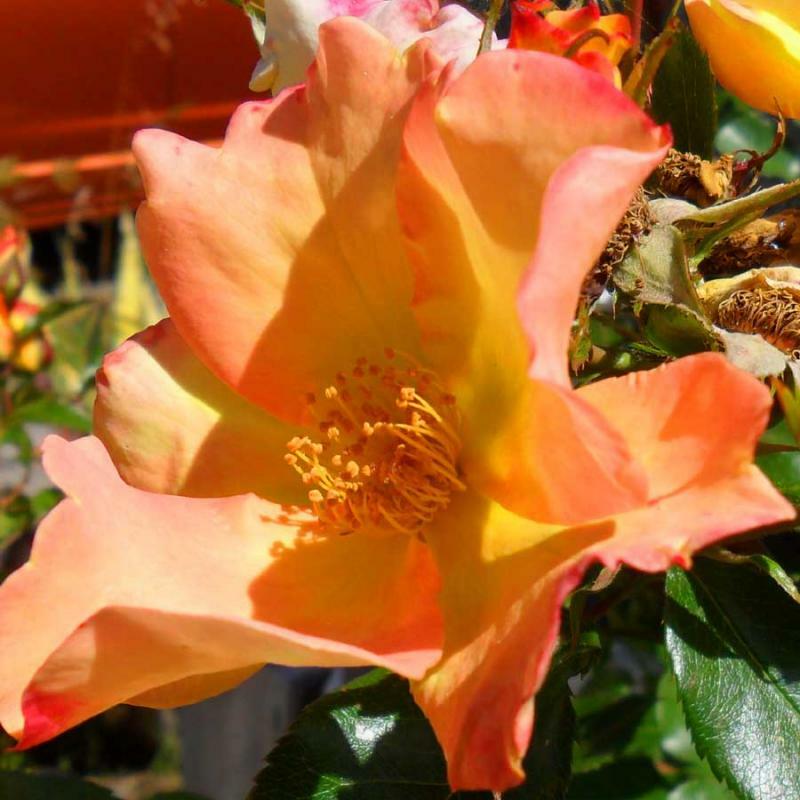 All joking aside, mid-December through February is the time to find many new and old favorite varieties of bare-root roses at your local nursery. Wait another 4 weeks or so, and container roses will be available. Bare-root VS container roses, which is best? There are benefits to both. Bare-root: when you buy bare-root (these days bare-root doesn't mean totally bare-root, they come in ready to plant peat pots in a peat mixture), the cost is less and they are easier to handle. You can also find the new releases as they come to market. The roses are dormant (sleeping) when you pick them out, so there is less disruption to the root system. Container roses: the advantage here is they are usually in bloom, so what you see is what you get. You don't have to rely on a picture or a printed description. Pruning roses: there is no wrong time to prune. A general clean-up of broken, diseased, weak or crossing branches should be taken care of as soon as you notice. Dead roses should be removed on a regular basis. Technically, whenever you cut a rose to bring into the house, you are pruning. But now is the ideal time to give your roses an all over pruning. They are (or should be dormant). The first thing you to do is make sure your pruning shears are clean and sharp. Then start by removing any dead, damaged, crossing or otherwise errant branches or canes. Next remove growth pointing towards the center of the plant, and any side shoots from the larger canes. When you've opened up the plant, decide on 4-6 healthy, nicely spaced canes that you want to keep, and remove the rest. The remaining canes are pruned down to whatever height you wish. Some people cut them down to 18-24". I usually decide based on which roses should be the tallest in the garden. I have some roses that don't grow as tall, so I don't always prune them as hard. Make your cuts at 45 degree angles ( so water doesn't pool on the cut), just above an outside bud, (or in the direction you wish the plant to grow. Again I make the decision based on where the plant is, the ones in the backyard I prune so the canes grow towards the fence.) Now is a good time to mulch with a good compost (or Paydirt or Wormgold Plus). Climbing roses and shrub roses are handled a little differently, but that is for another time. For now I ask , which are you? The Rose-a-phobic, or the Rose-a-holic? Do you wish to conquer the condition? If so, go to your nearest nursery and GET HELP NOW! As I walked back from the mailbox yesterday, my arms loaded with reading material, I realized what this "season" is; Seed Catalog Season. To us, who can be outside doing something in the garden it might not carry the same significance as it does to someone who just dug their car out of a snow bank, but it's a season nonetheless. A season for dreaming, planning, maybe even sketching a new garden. I don't usually buy a whole lot from the various catalogs I receive, or the ones I get online, but they get dog eared and filed away for future reference. This is where I learn about all the new varieties; improved, earlier, later, bigger, better and even smaller. Actually those catalogs can save a lot of real work. You dream instead of planting and often come up with very real reasons why your dream might become a nightmare. Running bamboo comes to mind. The catalogs are a great resource for what is possible, and I applaud when they are very specific about zones. Even when I ignore the zone advice, at least then I have an inkling of why my Stevia didn't make it. No matter how many nurseries you visit, you can never be exposed to the variety you find in one catalog. I'm not denying the value of your hometown nursery, they just don't have the room. Often the only place you can locate that hard to find something, you've only read about, is through a catalog. One thing I have to try every year; the newest Charentais type melon. I don't even know how to pronounce that word but the melons are wonderful. They usually require the fewest days to maturity. Because I don't live in a zone (that word again) that's hot enough to produce melons, I stack old windows around the vine, put chunks of concrete and big rocks inside to give off heat at night and fertilize with any and all products that are even discussed in passing with melons. Some years I've gotten as many as 6 melons, don't laugh, they were worth every bit of effort. This year I think I'll try Alvaro, 65 days. When you're through with the catalogs there is another season waiting for you, it's called Pruning Season. This is the time to winter prune your roses and fruit trees. The word pruning seems to scare a lot of people, so I often substitute shaping and cleaning up. The more cleaning you do now, the better to enjoy the sights in the spring, and shaping just makes sense, keeping plants in their allotted space and getting the most bloom/fruit possible. Right now lots of nurseries are scheduling pruning clinics. Even if you consider yourself an old hand at the process it might be good to check one out and see the latest. Every few years someone comes up with a new twist, a new tool, or just a better way of doing things. As I'm preparing this the only facility that has contacted me with information about dates etc. is Farm Supply in San Luis Obispo. See Special Events for all the details. I will add more as I find out about them. For this issue I just got off the phone with Sharon Asakawa. She is Editor-in Chief of Garden Life and heard around the country every Satuday and Sunday morning on the nationally syndicated Garden Life Radio Show along with her co-hosts, husband Bruce and John Bagnasco. I was anxious to learn how Sharon who majored in foreign policy and political science ended up answering questions from gardeners across the United States. Just like in the garden, it's all about attraction. While she was busy preparing for a life in academia, Bruce was majoring in landscape architecture at Cal Poly, Pomona and working in the family business, The Presido Garden Center. They met in her father's church after another employee of the garden center told Bruce about the new minister and his daughter. As a young married lady, Sharon soon found herself also working in the family business, eventually managing the florist department, and getting a great horticultural education along the way. Now on any given week-end she conducts interviews with experts from all walks of life as well as fielding questions as diverse as, "What can I plant on the shady side of my house? ", "Why are my tomato leaves turning yellow? ", "What is the best grass for my area?" It's great radio to listen to the interaction of the group as they discuss possible answers and try to assist us all in having a yard ready for the Better Homes and Garden crew. In addition to the radio show and guest speaking, Sharon is also involved in putting together the Garden Life Newsletter which gives listeners a sneak peak at up coming shows. Articles on new plant introductions, trips, special gardens , how to's, you name it it's all there waiting in your in-box every Friday. When asked to pick some highlights of this whole garden experience, Sharon mentions travel. Along with all her other duties she puts together trips for her listening audience. "There have been so many great trips, Africa, South America, China, Japan and Canada are all favorite destinations, but the Galapagos Islands comes out the overall winner for so many reasons." W e talked about her future plans and Sharon laughingly mentions visiting grandchildren who are now relocating from Italy to Paris, France. She also tries to carve out a day or two for her own garden. She spoke of a grouping of plumaries outside the window to keep her company while she's busy on the computer. "Their perfume comes in and fills the room, " she explained. Other garden favorites include camellias and anything edible, and that's when the garden gnome whispered she is a fantastic cook as well. Sharon's most recent endeaver in connection with the Garden Life family is the brand new Gardentube.org It's You Tube especially for and about gardeners. When I checked it out I found everything from dividing Crinum lilies, to How Not to Lose a Garden Tool (pay a lot for it), improve your soil, build a drip system and on and on. You to are invited to share a video of something you've learned or maybe you just want to show off what all your hard work has accomplished. Together Sharon and her husband have written 2 books, the first, "Bruce and Sharon Asakawa's California Gardener's Guide" , now in it's seventh printing. Sharon and her cohorts can be heard every Saturday from 8 to 9AM and Sunday from 8 to 10 AM on 1440 in Santa Maria, 1410 in Lompoc, and 1340 in San Luis Obispo. They also stream live on lifestyletalkradio.com It's worth a listen just to hear Sharon's laugh as she tries to keep things under control and on topic. I can always remember being interested in gardening in some way or another. It probably goes back to my grandmother showing me how to divide a bulb of garlic into eight or ten cloves and planting those cloves for eight or ten whole garlics. That spurred my interest in both food and gardening. Like most enthusiasts, I get a great deal of satisfaction from seeing a garden or landscaped area all squared away and obviously cared for. We've all seen towns where there's one area of fine displays, people proud of their yards, even vacant lots growing something beautiful or useful. I couldn't remember that ever being the case in Orcutt. 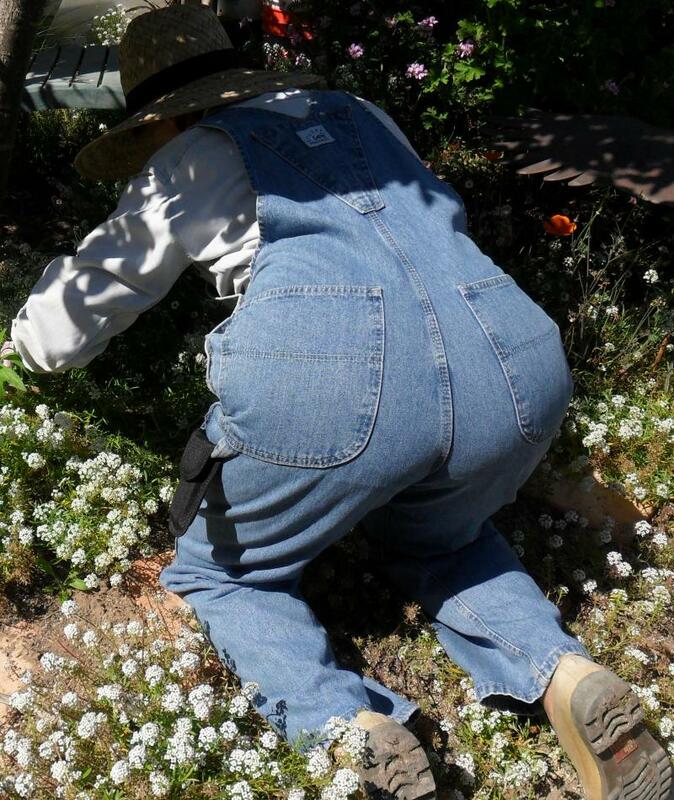 I saw a volunteer once in Santa Ynez, just this guy landscaping a vacant area near the high school. I later saw an article in the Los Angeles Times where people were doing the same thing at night with head lamps so they wouldn't get caught. I knew I could get away with it in broad daylight in Orcutt. And so it began with a patron of mine asking me, "What should we do with that old truck at the Loading Dock?" After that I looked for other opportunities to do public gardening in Old Town Orcutt. 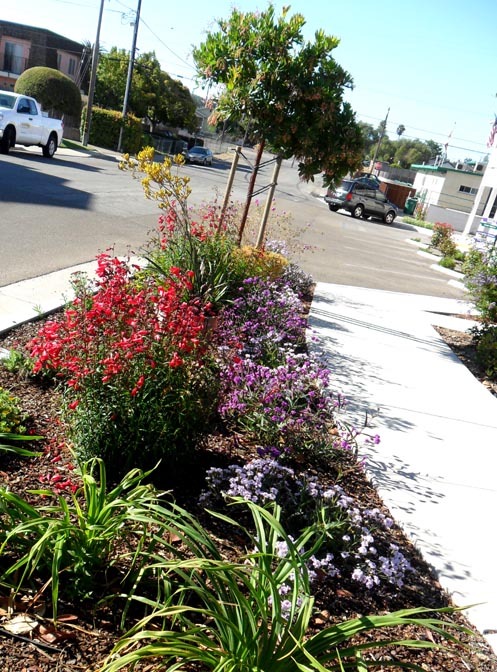 Besides the truck and planters at the Loading Dock, there is the planting at the westbound entrance sign to Orcutt, the Old Town Market intersection plantings and wall display, as well as the planters at the old bank building, corner of Clark & Broadway. I have had great support and sponsorship from the OTORA group, Orcutt Brew/Loading Dock, the Karamitsos family, and of course Mark & Wendy from Old Town Market. The big pay off for my efforts has been in seeing the trend catch on with others. There has recently been professional landscaping done at businesses along Clark Avenue. Others have taken my ideas and run with them in terms of container plantings. Still others are getting in the mood, seeing what is possible. I guess that was my point to begin with, to have Old Town Orcutt known as a great little town with a strong horticultural presence. Hopefully, it will continue in that direction. It is worth a little side trip to Old Town Orcutt to visit Danny's work, he is much too modest.....below is one of his interesting ways to dress up a narrow space. Northeast corner of Clark and Gray Street.